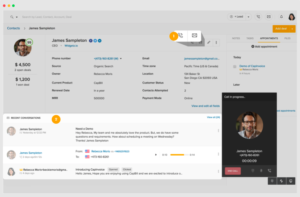 Freshsales is a full-fledged CRM with integrated phone and email, user behavior tracking, lead scoring, deal pipeline management and more. It allows us to manage and track our sales seamlessly to ensure we are getting the best results through our efforts at CloudChoice. Below will give 5 benefits we gain from using Freshsales. I am also attaching a Freshsales demo at the end of the article for you to see it in action! Freshsales is able to crawl the web to search for the leads facebook, twitter, and Linkedin accounts. I like to see who I am dealing with on a personal level, Freshsales pulls up a picture of the contact. This feature is important to us because it allows us to add a personal touch to our sales process. Don’t you want to see who you are dealing with behind the computer screen? Furthermore, Freshsales has the ability to score leads based on your own customized personal touch. For us at CloudChoice, we give more points when our leads open and click upon our emails. By doing so allows us to really nail down who our potential clients might be. Freshsales has built in phone and email integrations. I can send an email a follow-up email after a call in a matter of seconds by selecting from the templates I have created. The system then tracks if the email was sent properly and if the prospect opened up the email. Calls, emails, and activities are auto-logged so you can focus on selling, not on data entry. Salespeople are very particular with the way they manage their leads, I know I sure am! I need specific things put in place so that I know I am maximizing my productivity. Freshsales allows you to really uncover CRM by creating custom fields that you can add for leads. For example, at CloudChoice we have many partners and are always looking to add new partners to our list, so I recently created a “Potential Partner” checkbox that is listed under each of the leads. I am also able to move around which fields I want view near the top by simply dragging and dropping. Whenever I come across a potential new field idea, I can simply go in and change it. At Cloudchoice we have many different products that we sell ranging from IT Helpdesk to CRM. Freshsales can have a view for each product that you are selling so that you can better manage each product. I have set up 3 separate pipelines; customer support, CRM, and IT Helpdesk. Now deal tracking is fun and done effortlessly just drag and drop! I tend to get side tracked and forget about potential follow up calls and meetings. After each call and email, I can easily add a task to remind my self to stay on top of a lead. 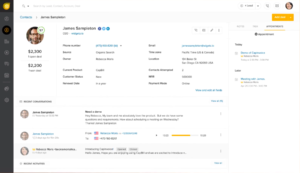 You can view all your meetings and appointments in one single view it’s great to have this feature within Freshsales so that I don’t have to jump from platform to platform. Once you are done with a task just select the check box and it’s off your list of things to do. Sound interesting? Enjoy a free 30 day trial from our team at CloudChoice.